FeverAll is a great fever reducer/pain reliever to always have handy in your medicine cabinet. I don’t review medication products that often on my blog but I was really interested to know more about FeverAll. 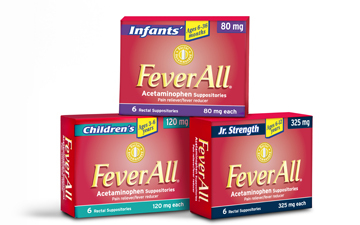 FeverAll is an acetaminophen suppository. It is also the only acetaminophen suppository approved for infants as young as six months. If you are a parent and have ever found it difficult to give your child something to reduce fever because of vomiting, you may find that having this handy just in case may be useful. When my middle son gets sick, he gets sick. For some reason every time there is vomiting involved, he can never keep anything down. And when I say he can’t keep anything down, I mean he can’t keep anything down. Not even a glass of water. Our other kids have never had this problem. They have been sick before with vomiting but we have never had to worry about them getting dehydrated or anything because getting fluids in them even when their stomach was upset isn’t a problem. But our son on the other hand is another story. A while back (around the beginning of the school year) he had gotten sick and of course vomited every time he swallowed something. He had a fever and I gave him some Tylenol to try to get it down. It didn’t work because he couldn’t keep it down. Worried about dehydration and the fact that we couldn’t get his fever to go down or break, we ended up taking him into the ER. They ended up giving him a fever reducing suppository to get his fever down while we were in there. Here recently my whole family had the stomach flu. You might have seen my mentioning on my facebook page that my family made me sick which was why it appeared that I had gone MIA. We had the same problem with this boy. I felt so sorry for him because he was so miserable, couldn’t keep anything down and once again was pointless to give him anything for his fever whether it was liquid or chewables. This was when we tried FeverAll. It worked great at reducing his fever and I didn’t have to worry about his temperature. He always gets it the worst than the rest of us but the up side is that he is feeling better a lot sooner than the rest of us. 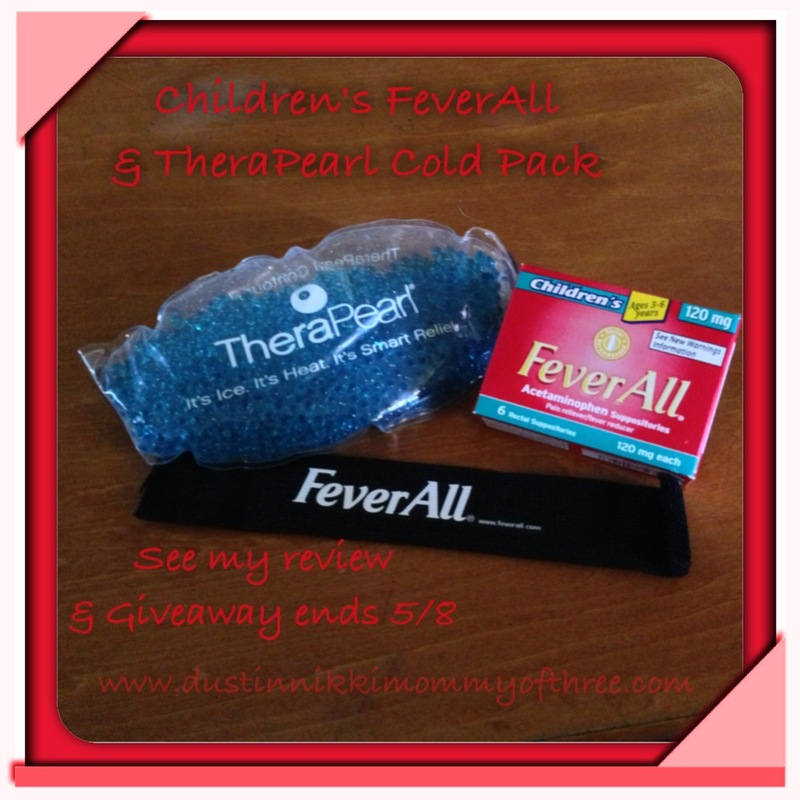 I also received a FeverAll TheraPearl Cold Pack and that thing is awesome. I have a few cold packs in our house but the ones that I have always freeze like a block of ice. This cold pack is filled with tiny bead-like things or pearls and they freeze without freezing together making the cold pack flexible instead of basically using a block of ice. It comes with a removable strap which is also adjustable. The whole back of the strap is velcro so you can always have the perfect fit. I only use FeverAll if I have no choice. It’s just nice having it handy when the stomach flu comes around again if one of them just can’t keep anything down with a fever. I’m glad FeverAll is an acetaminophen because that is also what Tylenol is. When it comes to oral fever reducers, that has been the only one I have ever given to my kids. Now I trust FeverAll for those times when an oral fever reducer isn’t an option. Buy It: FeverAll® is available at major retailers and drugstores across the U.S., such as CVS, Rite Aid, Walgreens and Walmart, for a suggested retail price of approximately $7.00 for a package of six suppositories. Learn more about FeverAll® at www.FeverAll.com and join our community at www.Facebook.com/FeverAll. Win It! 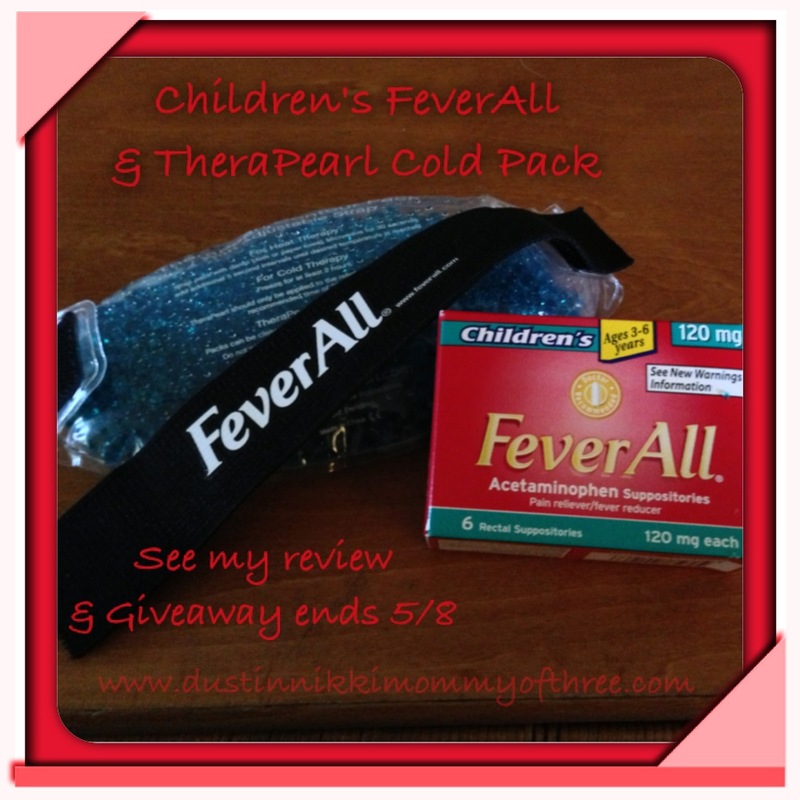 Thanks to FeverAll, one of my lucky DustinNikki Mommy of Three readers will win a pack with FeverAll (in the strength of choice) and a FeverAll Cold Pack like the one I received. Disclaimer: I was not compensated for this post however, I received product(s) for free for purpose of review from FeverAll. Giveaway prize will also be provided to the winner for free from FeverAll. Any opinions expressed in this post are my honest opinions and are 100% my own although they may differ from others. I am not a doctor and do not claim to be, just giving my opinion about a product and not giving actual medical advice. I learned that suppositories are they easiest way to give both infants and children a dose of medication, I agree! They have products good for all ages–from 6 months to adult.